The sun is the single most important thing in our solar system as without it we simply would’t exist. But how much do you really know about that big ball of fire in the sky? Here are some cool facts about the Sun. There’s no need to worry about this right now, but one day the Sun will destroy the Earth. Eventually the Sun will run out of hydrogen to burn and at that point it will expand and burn through helium. This expansion will see the Sun engulf Mercury, Venus, and eventually the Earth. As well as expanding there will come a day when the Sun collapses. This will happen after it expands and becomes what is known as a red giant. Eventually it will then collapse and become much smaller. It will end up around the size of the Earth and enter its white dwarf phase. The sun makes up roughly 99.86% of all the mass in the solar system, weighing 330,000 times as much as the Earth does. The sun is three quarters hydrogen, while the rest is helium. The Earth is roughly 150 million kilometres away from the Sun (remember that this number changes all the time as the Earth orbits the Sun), and as light travels at roughly 300,000 kilometers per second, we can work out that the light from the sun reaches the Earth in roughly 500 seconds. This is eight minutes and 20 seconds. Even more amazing is that even though it reaches the Earth in a few minutes, the Sun is so dense that it takes millions of years to go from the core of the Sun to the surface. The Earth is around 4.5 billion years old and is about half way through its supply of hydrogen. There is about five billion years of hydrogen left in the Sun, so humanity will be long gone by the time that runs out. If humans still exist, we should be in another galaxy entirely by then and well away from the expanding Sun. Did you ever wonder how hot the Sun was? Well now you know. 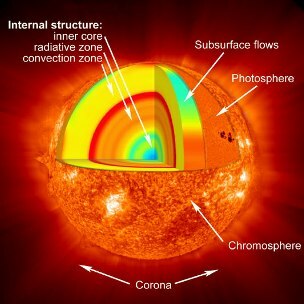 The heat of the Sun is generated through nuclear fusion as the hydrogen becomes helium. Because heat causes objects like the Sun to expand, the Sun would literally explode like a giant nuclear bomb if it wasn’t for the incredible gravitational forces holding it all together. The Sun has a lot of really awesome secrets that can really blow your mind. You should definitely show an interest in that great ball of fire. Just remember not to look directly at it! Because the Sun has a huge influence on Earth, many early cultures saw the Sun as a deity or god. For example, in Aztec mythology there is a sun god which is named Tonatiuh. Whilst with the Ancient Egyptians, they had a sun god called Ra. In the sixteenth century, Nicholas Copernicus argued that it was the Earth that traveled around the sun – not the sun traveling around the Earth, as thought for centuries. However, it wasn’t until Newton formulated the laws of motion, that Copernicus’s view of the solar system was accepted.